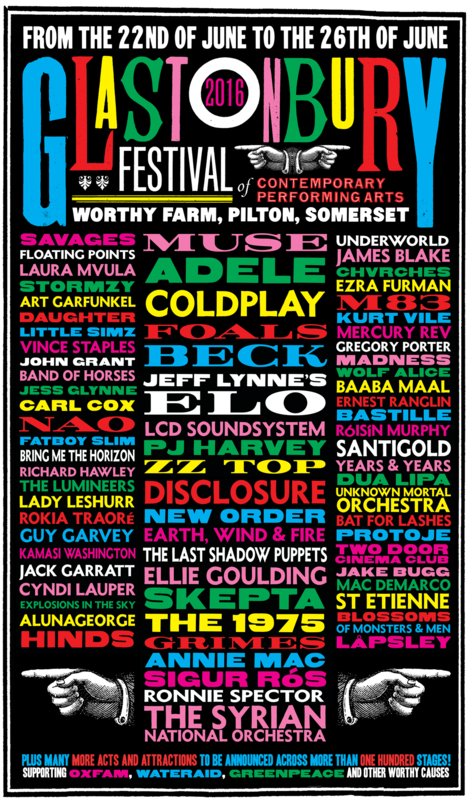 This is the line up that Glastonbury have put together to celebrate my birthday on June 22nd. What a pleasant gesture. I must write Michael Eavis a nice thank you letter. That is right. When we take the U15s away on their end of season tour, the nearest pub will be 220 feet or a minute's walk from the YMCA where we are staying. I read in Empire Online that the latest international trailer for Warcraft: The Beginning is available. Once upon a time (Icons passim) this would have been a big deal for the Bomber, but I think that ship may have sailed. Listening to him talk to Jonnie in the car when I am ferrying them to training, Ark: Survival Evolved seems to be the game du jour these days. ARK Survivors can now experience the one-week-only "Eggcellent Adventure" Event! During this limited-time event, players can collect special "Bunny Eggs" across the ARK, which they can paint or use in special recipes to craft bunny-themed items such as Bunny Ears, or even a Bunny Costume for the Procoptodon! Though Survivors should beware the ferocious Bunny-Dodorex that will roam the ARK throughout the week! Patch 237 also introduces the much anticipated challenging new Swamp and Snow Caves, which are heavily-geared towards High Level Survivors, containing high-end loot, advanced artifacts, and more clues towards the mysterious Origins of the ARK; keep an eye out for those Snow Cave Yetis! I must pass this on. I don't think I could live with myself if the ferocious Bunny-Dodorex got hold of them over the Easter holidays. I will never understand, but I find I am entirely relaxed about that. I read on the Time Out website this morning that, according online ordering service Hungry House, the UK's number one takeaway is Ambience, a Turkish place in Wimbledon. Ten minutes from my gaff, and I've never heard of it; a restaurant as well as a take away. Onto the bucket list go http://www.ambiencerestaurant.co.uk/ to eat in, and http://www.takeaway.com/ambience-restaurant to eat out. Delivery is free, but there is a minimum charge of £18. In the unlikely event that I am not eighteen quid's worth of hungry a £9.95 Istanbul Iced Tea will take the strain. All cocktails are served in a 750ml glass bottle with ice. Combination of tequila, vodka, gin, Bacardi and triple sec, topped with fresh lemon juice, Pomegranate juice and a dash of Raki. Another stellar line-up was exclusively announced for this year’s tenth anniversary Wimbledon BookFest at a glamourous event in the Houses of Parliament last night. News that Sir Ranulph Fiennes will launch the festival in September, with Jeremy Paxman and former Wimbledon resident and poet laureate Carol Ann Duffy on the line-up, was met with gasps of delight by guests. Strictly, I think the gasps were inspired by my audacity in nicking an MP's glass of white wine from a table when he was called away by the division bell and then raising it in the toast he proposed at the end of his speech when he returned. In my defence I had been listening to Chloe Spicer of Object Book explaining conceptual art to author Michelle Paver, so it was probably a playful, provocative and subversive avant-garde prank summoned à la Marcel Duchamp from my subconscious rather than common or garden ASBO baiting. Prodnose: Yes, that must be it. No doubt about it. Woody Allen: I was in analysis. I was suicidal. As a matter of fact, I would have killed myself, but I was in analysis with a strict Freudian and if you kill yourself they make you pay for the sessions you miss. I spent most of the day in a vegetative state on the couch binging on Amazon Prime TV and movies. This is so unlike me that I thought I would record it here. This evening though, Cardiff Blues have beaten Benetton Treviso 56 - 8, to revenge a defeat earlier in the season; the one that so vexed Gareth the rugby gnome (Icons passim). Even better, on 74 minutes Tom James got his name on the scoresheet after a break from Dan Fish sent him over for his ninth of the season, then four minutes later Fish himself sprinted over from long-range for a special solo effort. We may expect more spring in my step tomorrow. Wimbledon MP Stephen Hammond is hosting an evening reception on 23 March at the Terrace in the House of Commons to celebrate Wimbledon BookFest's 10th anniversary. The event will mark the work of the Festival’s partners and supporters, its Founding Chair, Tony Kane and 10 years of promoting the arts, culture and education in Wimbledon and the Borough of Merton. So that is where I will be tonight. Amazon Prime Music has analysed my listening patterns and suggested that I might like Joe Bonamassa and Beth Hart's collaborations. Amazon Prime Music is right. We’re going to deliver your package today. I finally got round to digging the dud light bulb out of the fridge at about half past five on Thursday. Once I got a look at it, I searched fridge bulbs on Amazon, recognized the model among the results and ordered one free delivery via Prime. It arrived at half past ten Friday morning and I fitted it last night. Isn't that astonishing. A decade ago figuring out and sourcing something like that would have been a time-vacuuming pain-in-the-proverbial. Prodnose: This is the least interesting thing I have ever heard in my life. Myself: What can I tell you? I'm committed to chalking something up here every day and now and then the cupboard gets bare. Would you prefer to hear that I am so sad that I stayed in last night to watch Wales U20 beat Italy to win our first ever Grand Slam at that age group by the deceptively simple expedient of tricking the BBC iPlayer into thinking I was in Wales and serving up the Principality's version of BBC 2? I went to the Royal Standard last night for St Patrick's Day. I knew that the landlord and a lot of the clientèle were Irish but I didn't realise it was quite such a big deal as it is. The place was already rammed when I turned up at six o'clock. I tend to agree with Warren Gatland about the "Gypsy boy" comment aimed at Samson Lee by Joe Marler in last week's game, "It was just one of those things, a little bit of banter. We've accepted that and we've accepted his apology. Just move on." If I was Marler I would be tempted to claim that I was singing Leonard Cohen's "So long, Marianne" to myself to keep my spirits up, as the third line of that is "you know I used to think I was some kind of gypsy boy". Simple solutions are often the best. Perhaps he could post a solo acoustic guitar version to YouTube by way of illustration. I was also looking - as you do - at the French Wikipedia page about Guy Novès, les Blues' coach ahead of the France England game on Saturday evening. It says that his nickname is le sorcier le gitan. Rendered in English le sorcier le gitan is the gypsy sorcerer. The Bomber was at the Rosslyn Park 7s yesterday playing a year up for the school at U16. They didn't do all that well but did, at least, beat Cardiff High which was gratifying in terms of bragging rights because his cousins Mia and Isaac attend Cardiff High and are actually in the U16 cohort. Moving from Rutlish school to the Old Ruts U15s in Surrey league 1, this weekend's results mean that we can see the likely final state of the table as there is only one round of fixtures left. Kings will win, London Irish will be second and we will be third unless London Irish beat us and Reeds Weybridge Guildford beat Richmond Warlingham soundly enough to get a bonus point, in which case we will be equal with them on points but may be nudged into fourth by points difference as ours is only 7 better than theirs as I write. If you had offered me scenario that before the boys' debut season in the county's top flight I would have bitten your arm off. We won the quiz at the Antelope last night so the £50 bar tab prize will pretty much take care of the refreshments next Monday. During the evening Raphel told us that his brother Carl is in the West End production of Motown the Musical that just opened in the Shaftesbury Theatre‎. I didn't get to see him when he was in The Scottsboro Boys (Icons passim) so I should really try and get along to this. He is playing Rick James. Crikey! Fermentation is one of our oldest methods for preserving food. All around the world people have been transforming food with the help of microbes for thousands of years. The problem is, this simple method has had an identity crisis. We tend either see it as a fashionable fad, or a strange science. But there are people who want things to change. So in this programme Sheila Dillon meets 'The fermenters'. Ukranian food writer and chef Olia Hercules, who grew up with fermented foods; Roopa Gulati, using fermentation to explore her Indian heritage; entrepreneur Deborah Carr, whose fermentation business is going from strength to strength; and seasonal chef Tom Hunt who is putting seasonal ferments back on his restaurant menu. In 2016, It's time to rethink fermentation. One for you John, master pickler that you are. I heard this episode of the Food Programme on the way back from the Ruts yesterday. Oh, and while I am on the subject, slow cooker bacon jam is probably right up your alley as well. Wales remain on course for a junior Grand Slam with a spectacular first ever win away to England at Under-20 level. Jason Strange's side led 28-3 after just half an hour in Bristol. Fly-half Dan Jones collected 17 points including a try while there were also touchdowns for Shaun Evans, Harri Millard, Keelan Giles (2) and Harrison Keddie. Sam Smith crossed for England while Matthew Protheroe kicked 11 points. Wales already have a Triple Crown under their belts as they tackle winless Italy in their final game at Colwyn Bay on Friday 18 March, while England face France in Pau on the same night. I have already put the heartache of Twickenham yesterday behind me and started dreaming of the future. How's that for emotional robustness and mental toughness! This should help get you up for the England game! England and Wales have both selected unchanged starting fifteens for Saturday's match. The underlying psychology is clear to me. Wales are confident; England unsure of themselves. Gareth TRG and I will be watching the game in the Charles Holden with Gnome Chomsky, Gnomer Simpson, and Sherlock Gnomes. It is good to get out, after all gnome man is an island. I stumbled across Mint and Mustard in Whitchurch Road when I was back in Cardiff over the weekend; "Keralan passion, British style" and one of the top 20 curry restaurants in the UK according to the Telegraph. I fell in love with Kerala when we were there for Christmas and the New Year as 2003 turned into 2004, so Mint and Mustard's tasting menus and chef master classes go straight onto my to-do list. "Come on it's just fun, isn't it hun?" Gareth the rugby gnome is back home, in plenty of time for Saturday's England game. Last season Warlingham beat us in league 2, but yesterday (after a season in which we were both promoted) the Old Ruts U15s beat them 43-21 in Surrey's top division. Outstanding performance today from the League 1 team. Probably the best I have ever seen us play. We were 14-0 down after 10 minutes and turned it round to completely dominate the game. We scored 7 outstanding tries, including a sublime flick out the back of the hand from Wes (having brilliantly turned the ball over) which gave Sid a run in on a perfect line. It was a joy to watch. Our forwards (once again) won us the game. They dominated Warlingham with some awesome control and power from 1 to 8. Even when Ale moved out to centre, we continued to be the better pack by far. The most pleasing thing was as we rolled on the subs, there was no change of gear – hats off to you all. Obviously there were a few tasty moments, particularly the two nasty attacks on Ben VHO. That type of behaviour has no place on the rugby pitch. It was though to your credit that despite the moments of tension, you all stepped away and did not stoop to their level. While they disintegrated mentally, you boys just got stronger – all credit to you. We had two boys playing up from League 4, Nathan and George – both contributed fantastically on the pitch – well done. In two weeks, 20th March, we have a huge day at the Club. League 4 playing Guildford followed by League 1 against London Irish. Both will be properly tough games, but carry on playing as we did today and nothing is impossible. Bring it on! The Bomber picked up the third try that put us into the lead and was immaculate under high balls all day. All Warlingham's tries were scored by their mercurial winger (Daniel I think he was called) and now that the dust as cleared I am beginning to realise that they didn't really threaten us at all apart from when he had the ball in his hands and we actually dominated throughout. A win with a bonus point also cements us at third in the table. Two of the seven teams in the division will be relegated this year, and yesterday's victory makes us all but safe. I would have settled for that at the beginning of the season. Happy Mothers' day. It is good to be back in Wales to say it face to face even if I have to leave quite early for Poplar Road. I have got you a card ......... which I have just realised is still on the dining room table back in London in my house. I am back in Cardiff visiting Mum and Dad,which means I might as well be at Hobbiton in the Shire for all the access to technology I have. Today's post was therefore queued up yesterday and you will have to amuse yourself with 6 Great Articles about Cows until I get back. We got an email last night saying that Ralph Brazier, the father of Louis - a former Old Ruts team mate of Ben, had been killed in a cycling accident. 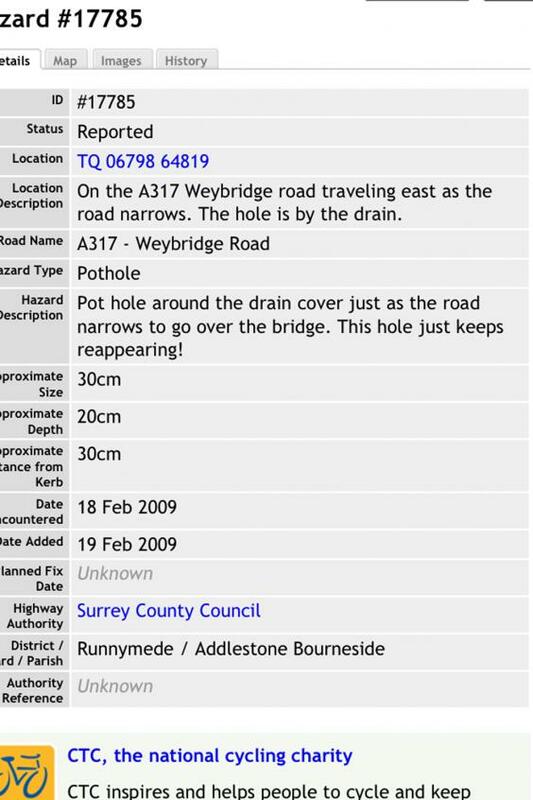 The pothole had been there since 2009. Words fail me. His boys transferred to Esher RFC after the family moved to Thames Ditton, but I still very particularly remember him pulling a folding bike out of the boot of his car at London Scottish, when the kids played mini rugby and all age groups were at the same venue, so he could commute between pitches on it, watching Louis in our age-group and Louis’s brother Nate in the year below. Initially I thought he was off his head, but the more I thought about it the more I liked the idea. A very sad loss. When I told Ben this morning, he initially thought I meant Louis Cohen's dad, Mitch. You need to be very careful to be clear passing on bad new like this. Update: Surrey Police have issued this statement. Madness are to headline their own festival in London this summer. The band have announced plans for House of Common, a one-day event on August bank holiday (29th) on Clapham Common. Pre-sale tickets will be released at 9am on 2 March to those who sign up on the event’s website.